So guys… listen up. Lets talk HomemadeGranola Bars . Breakfast is extremely important. If you didn’t know, now ya know. I just made that up but it sounds so legit? Maybe it's a thing? Anyways, I won’t get all nutritionist on you as to why breakfast is important… but I will say that it does get your metabolism going and fuels you with energy to start your day. SO DO IT. This is when good ol’ granola bars come in, but hey not so fast, STORE BOUGHT GRANOLAS ARE A BIG NO NO. They aren't healthy...and even the "healthy" ones aren't very healthy. Homemade ones are the way to go. I found this recipe a while back, tweaked it to my liking and now I’m hooked. They are packed with quinoa, chia & other wholesome nuts, with no added sugar and NO GLUTEN! (if you use gluten free oats) These make for the perfect quick & healthy breakfast for all you on-the-goers. Make these babies on a Sunday and you’re set for the entire week. Chop up your nuts (there's no cute way of saying that) and combine. I put mine in the blender for a about 15 seconds. Preheat oven to 375 and lay out all the nuts and oats (not the quinoa) on a baking sheet lined with foil. Toast in pre-heated oven for 15-20 mins stirring occasionally until lightly golden. This step isn't really necessary, but I like more of a toasted taste. 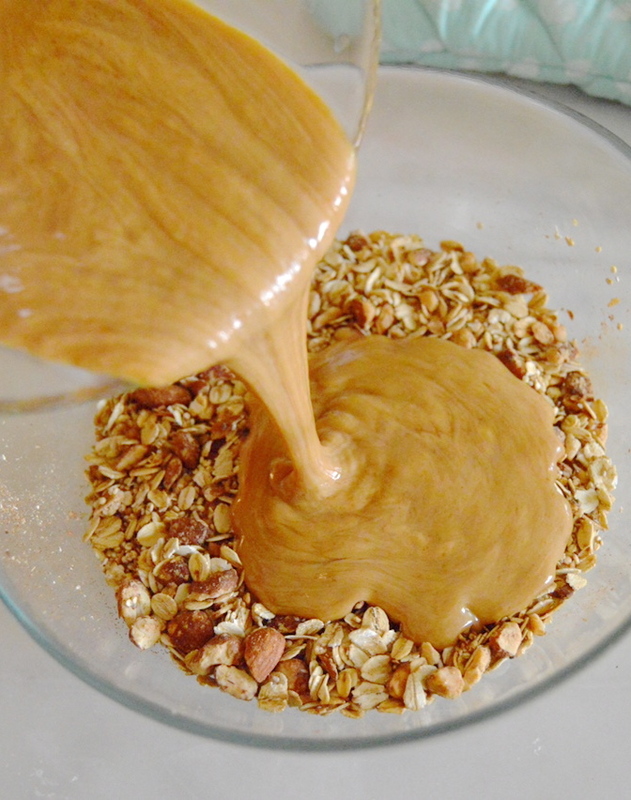 In another small bowl, combine wet ingredients: honey, peanut butter, coconut oil & vanilla. Blast in microwave for 20-30 seconds to slightly melt <-- easier to stir. Press down granola mixture on baking sheet until tightly packed, bake for 15 mins or until lightly golden. When cool, cut into whatever shape your little heart desires OR break it up for yummy granola cereal bits. JUST SAY NO TO STORE BOUGHT GRANOLA.